Many of us who remember the March 1997 floods in Kentucky recently had uncomfortable pangs of foreboding as storm systems dropped heavy amounts of rain freight-trained across the state. It looked like another 1997 for a day or so. Small, normally docile neighborhood creeks suddenly filled basements, eroded roadways and carried away belongings. Lexington set an April record for rainfall over the span of one day. Baker believes smallmouth bass waters lying downstream of major lakes such as Green River or Barren River will likely be blown out for a considerable time. Smaller streams clear and return to normal much quicker than larger streams and make the best option for smallmouth bass right now. Wading is an excellent way to fish smaller streams for smallmouth bass, especially after the recent high water events likely undercut many streamside trees, tipping them over into the stream, providing potentially dangerous impediments to paddling. The streams in south-central Kentucky near Bowling Green in the Barren River drainage such as the Gasper River and the Drakes Creek system are good places to try. Baker said the Drakes Creek system drains a large geographical area in karst topography and takes longer to flow out, but contains a healthy population of smallmouth bass from 12 to 16 inches long, with a few in the 18-inch range. The Drakes Creek system and Gasper River are part of the Warren County Blueways, a cooperative project from governmental agencies, Western Kentucky University and other groups to provide access to streams in south-central Kentucky. The website at www.trailsrus.com/blueways/ contains good information on access points with a detailed map. Baker said those streams flowing through public land in eastern Kentucky provide productive wading fishing opportunities for smallmouths. The Middle Fork of the Red River inside Natural Bridge State Resort Park in Powell County holds a decent population of smallmouth bass with good access. Rock Creek inside the Daniel Boone National Forest in McCreary County offers wading anglers easy access with roads paralleling the creek for most of its length. The best fishing is upstream of Rock Creek’s junction with White Oak Creek. Rock Creek is known as one of Kentucky’s true mountain trout streams, but the creek holds a stable population of smallmouth bass. 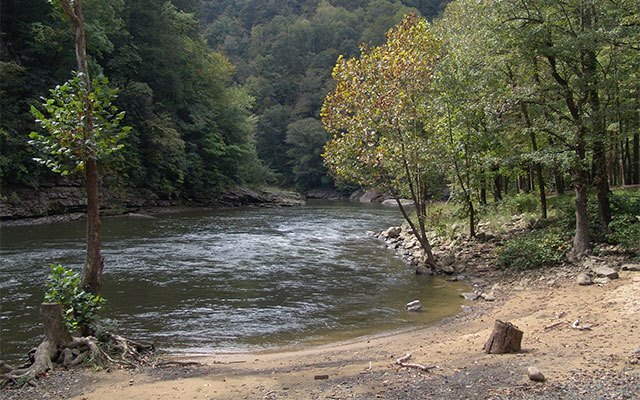 The Russell Fork in Pike County offers several productive public wading spots for smallmouths. The public river access at Ratliff Hole (also known as Potters Ford) inside the boundaries of Breaks Interstate Park on KY 80 south of Elkhorn City makes one of the most scenic wading spots in Kentucky. Wading anglers may also access the Russell Fork at Carson Island Access via Carson Island Road off KY 80, just east of Elkhorn City. The Elkhorn City Park in downtown Elkhorn City grants anglers public wading access to a productive stretch of the Russell Fork. Elkhorn Creek in Franklin County fishes well even when the water is up a bit. Anglers may wade fish the Elkhorn at T.N. Sullivan Wildlife Management Area off KY 1262 and at the two Voluntary Public Access spots near the junction of Peaks Mill Road (KY 1900) and KY 1262. All the lures you need for a successful wade easily fit inside a cigar box. A pack of 1/8-ounce leadheads, some black finesse worms, a bag of green-pumpkin tube baits along with a bag of 4-inch Senko type soft plastic jerkbaits in the same color all catch stream smallmouths. Add a floating/diving minnow lure like a Rapala and you’re set. For more information about smallmouth streams in Kentucky, visit the Kentucky Fish and Wildlife website at www.fw.ky.gov. Click on the “Fish” tab, followed by the “Recreational Fishing” tab and then the “Kentucky Smallmouth Streams” tab under the “Where to Fish” banner. The license year expired Feb. 28, so remember to purchase your fishing license before fishing this year. Editor’s Note: Author Lee McClellan is a nationally award-winning associate editor for Kentucky Afield magazine, the official publication of the Kentucky Department of Fish and Wildlife Resources. He is a life-long hunter and angler, with a passion for smallmouth bass fishing. Get the latest from Lee and the entire Kentucky Afield staff by following them on Twitter: @kyafield.